Los Angeles City Councilmember Gil Cedillo kicks off today’s Stop the Housing Ban press event. Photo: Joe Linton/Streetsblog L.A. The Neighborhood Integrity Initiative, in the name of fighting mega-projects, would heavily restrict a broad range of market rate and affordable housing projects. NII is now expected to go before L.A. County voters in March 2017. Today’s coalition speakers included Los Angeles City Councilmember Gil Cedillo, and representatives from the Los Angeles Area Chamber of Commerce, homeless services provider Jovenes Inc, the United Way, the Lake Balboa Neighborhood Council, Climate Resolve, and others. Speakers criticized NII as a way to continue southern California’s outdated model of sprawling suburban development. Coalition speakers anticipate that NII will exacerbate Los Angeles’ housing crunch—driving up rents and increasing gentrification and homelessness. Various speakers elaborated L.A.’s huge need for new housing at every level, from homeless to affordable to middle class to market rate. Jones further stressed that the NII’s stated two-year ban on non-by-right development is effectively likely to be more of ten-plus-year ban because no GPAs are allowed until community plans are updated. L.A.’s community plan updates easily take seven or more years to formulate and approve. This long delay is in part due to anti-development lawsuits brought by NII supporters. Councilmember Cedillo concluded the press event emphasizing that working families need places to live in L.A., and that the NII would lead to greater sprawl and longer car commutes that are bad for the environment and the climate. One of my biggest beefs with NII is it requires plan updates to designate land so that what you can build on it is similar to what’s already built around it. Even if people come together in a planning process and decide they want to plan for walkable urbanism, that plan would be vulnerable to lawsuits. There’s a legitimate debate to be had about the merits of preserving drivable suburban areas as they are versus shifting to walkable urbanism, but NII dumbs that debate down and acts as a blunt cudgel against any attempt to transform the city. Good to see lackadaisical Housing Committee Chair, Gil Cedillo opposing NII. But a broad coalition? Yes, overall there is a large and growing coalition to defeat NII in March 2017, but the photo here shows just a fraction of that coalition. With all things Gil, it’s important to notice who’s not there (e.g., the Mayor, County Supervisors, other Councilmembers, developers, unions, other coalitions…). If this was a popular councilmember with organizing skills there would have been hundreds at that press conference yesterday. Undoubtedly there will be other, larger, more impressive Anti-NII pressers held by our Electeds as we get closer to March. It should be interesting to see if Cedillo is there or not. After you defeat the NII,which is a nightmarish elitist idea from hell, it’s time to move on. I’d suggest a rule simply allowing any building of any height for any number of families, shops, or any non-polluting industries, to be built as-of-right provided it is structurally sound and complies with the building code, but prohibiting the construction of parking lots as-of-right (so that they all require amendments). Basically ban zoning. Too radical? It would solve the housing problem. And it’s what you had in the 19th century. 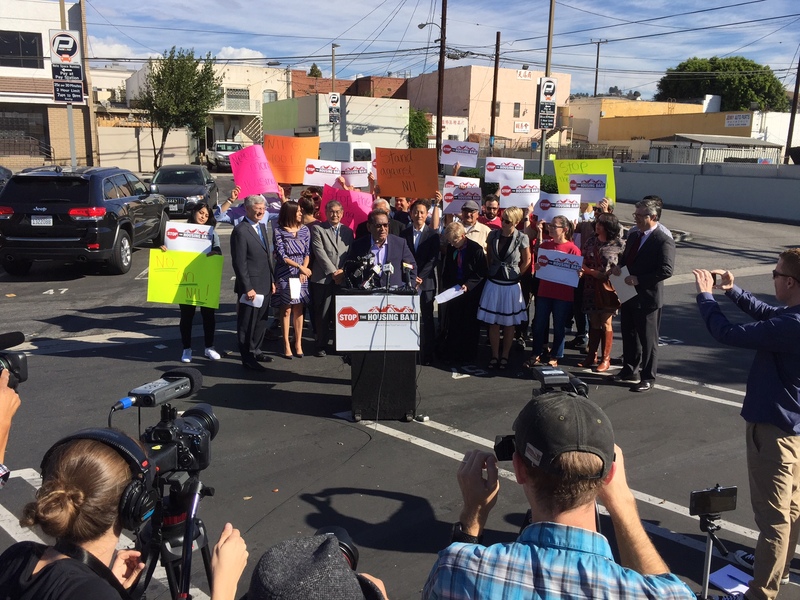 Mayor Garcetti, business, labor, environmental and housing leaders - and Streetsblog L.A. - are encouraging you to vote no on Measure S.